Strawberry Chic: 50% Off Gap Denim! I don't know about you, but I love Gap and was so excited when I got this email! 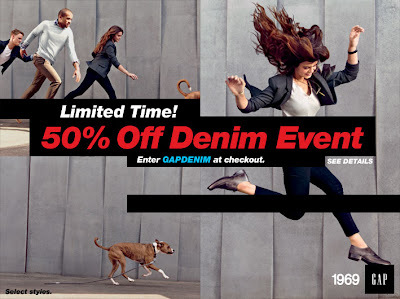 Click on the above image or go to Gap.com and use the Promo Code GAPDENIM at checkout to recieve 50% off! Really? Sweet! Thanks for the heads up! I just realize that I typed DEMIN and not DENIM! Sorry about that. I hope it didn't cause and confusion. The promo code should be correct now.